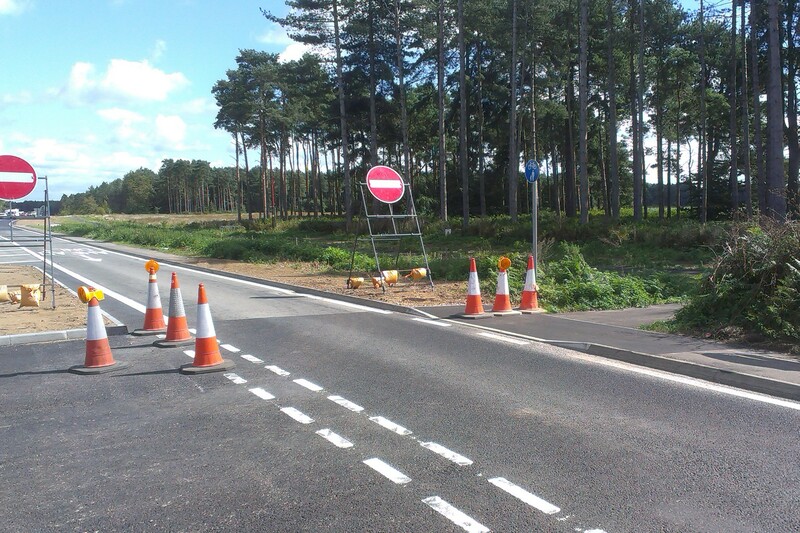 Yesterday, I went to have a look at the newly opened junction on the A11, that allows southbound traffic to exit north-east of Elveden on to the old London Road through the village. 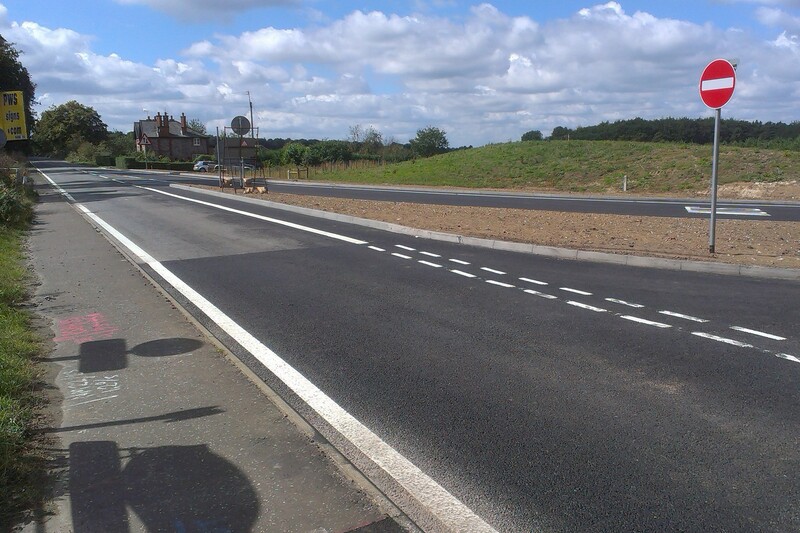 This is also the place where the new cycle path that runs parallel to the A11 from the Sainsbury’s roundabout in Thetford re-joins the carriageway. I do not know if the current configuration is intended to be final, but the route that south-bound cyclists are currently forced to take is somewhat dangerous. The cycle-path rejoins the carriageway opposite the exit from the turning loop, which is great for those heading north. 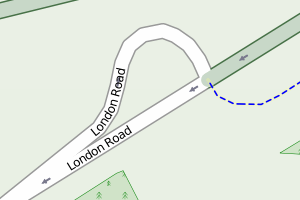 However, those heading south are forced to use the narrow single-lane one-way section of road opposite the turning loop. The traffic here is likely to be fast moving as it will have just come off the A11. The physical width of the lane means that there is insufficient physical space for cyclists to be overtaken safely. The view looking west towards Elveden from the cycle-path exit, showing the narrow single-lane section opposite the turning loop. The view looking east from the turning-loop island at slip-road coming off the A11 and the cycle-path exit. The turn from the new cycle path to the footway is too sharp. The effective width of the footway is only about 1.5m at its widest, below recommended guidelines. The path narrows below this value as you travel south. Given the fast-moving vehicles on the road and the narrow carriageway, cyclists will still be too close to the moving traffic. The problem here is made worse by the right-hand white lane line on the carriageway being so far from the right-hand curb, which will have the effect of moving vehicle trajectories closer to the footway side of the road. It’s unclear how far the footway will remain shared-use, but given the narrowing further south, cyclists may still want or need to return to the main carriageway. There seems to be no facilities for this merging. I have written to the Highways agency to enquire whether the configuration is supposed to be final, and if so to ask if they will reconsider. Ideally an additional short section of smoothly joined-in full-width cycleway would be provided so that south-bound cyclists can rejoin the main carriageway further south after it has returned to two-way traffic. The merging with the carriageway should be into a short section of cycle lane with vehicle diverted outside this, as shown on page 28 of the Sustrans Handbook for Cycle-Friendly Design. I have now had a reply from the Highways Agency’s contractor. Apparently the current configuration is not final and discussions are still ongoing about the junction with Suffolk County Council. 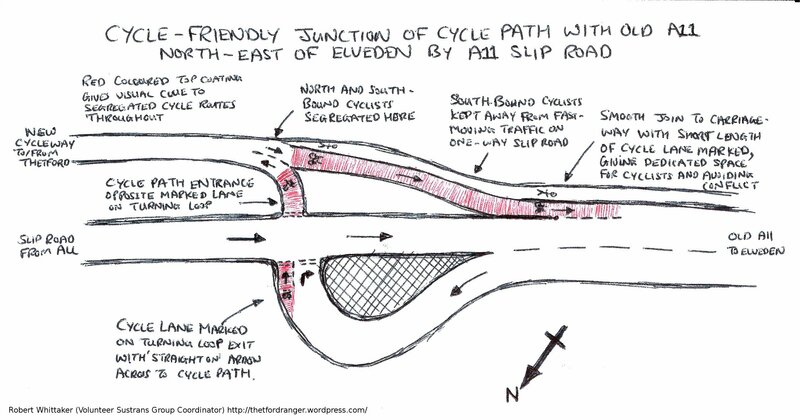 I took the liberty of sending a sketch of how the current layout might be improved (assuming a shared-use path isn’t to be provided all the way along the old A11). I’ve been back along the cycleway and written a new blog post about the (lack of) progress that’s been made.